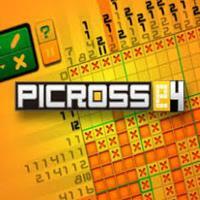 The fourth in a series of budget-priced downloadable Picross games for the 3DS. There are 105 standard Picross puzzles up to 20x15 in size (making this the first game in the series to include puzzles above 15x15) and 45 Mega Picross puzzles up to 15x15 in size, bringing the total up to the familiar 150. And that’s if you don’t have save data from earlier PICROSS e games - each one you do have data for unlocks five bonus Mega Picross puzzles, for a total of fifteen. And on top of all that, there are two Micross puzzles. For the first time in the series, you can choose between Normal and Free rule sets for all puzzles and play them all in your preferred way. Available assist features include Hint Roulette, Hint-Number Auto-Check, and ? Navigation. All assists can be selectively enabled or disabled at any time, except that every fifth standard Picross puzzle disables all assists and must be completed without them for some reason. This is a solid Picross experience with a lot of puzzles for the price point. With the increased flexibility in the rule sets and the optional assists, plus the largest-yet variety of puzzle types and range in sizes, PICROSS e4 is a great entry point, particularly for folks unsure if they enjoy Picross.